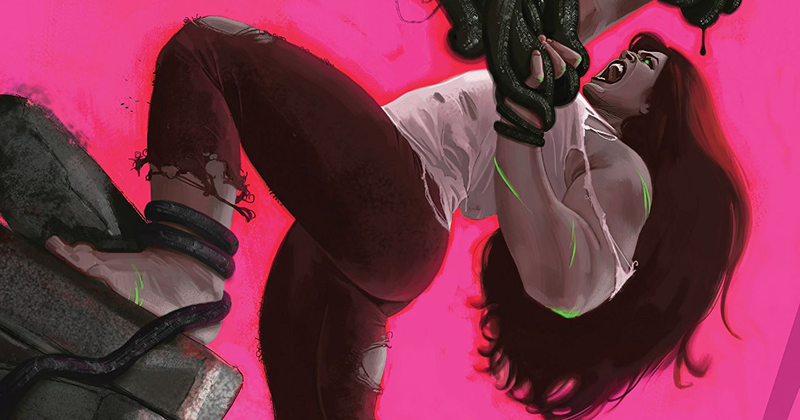 Hulk #6 Review – AiPT! Here we are ladies and gentlemen, the finale for the first story arc of the new Hulk series. Is it good? And so we bring our first story arc to a close and it’s rather underwhelming. To start with, the whole story with Maise feels like it just ends rather abruptly, with little conclusion and no wrap up outside of some narration. We get no word on what happened to the apartment or the other residents, no real answers as to where this fear creature came from or if it’ll come back, and Maise herself is… just shuffled off somewhere. To reiterate, this part of the story feels rushed and anti-climactic. Yay, Jennifer saved her life and this emotionally damaged (and in need of therapy) woman is being hauled off to jail… and that’s it. We finally get to see Jennifer Walter in her new Hulk form fight off Maise’s fear demon monster, but it’s lackluster and strangely enough, at odds with the tone and feel the series had been building up. Due to how Tamaki wrote the comic, having a Hulk appear in the actual Hulk book doesn’t really work or fit at all. That is, the appearance clashes with careful, slow-moving, and thoughtful approach and storytelling style used up until this point. I know, you really can’t leave out She-Hulk/Hulk in their titular book. So, in the end, the climax feels out of place but if Tamaki had left that crucial element out, it still wouldn’t work given the title of the book. Damned if you do, damned if you don’t. Jen looks more like she painted herself green instead of being Hulked out. So there’s problems with the story, but how does it hold up character-wise? Maise herself is still in the same spot as she was in the last two issues, someone who has experienced a great trauma that has affected her deeply. However, instead of trying to get help and accept it, she is never recovered and that’s where she is in the end, stuck in her own misery and unable to move on. Jennifer, on the other hand, embraces her inner monster… which doesn’t turn out to be as bad as she makes it out to be. Oh sure, the form doesn’t look good (we’ll get to that in a bit), but she strangely enough has a good handle on it. She doesn’t hurt anyone else, focusing only on the demon, and ultimately saves Maise’s life. The comic even ends with Jennifer accepting what she is, determined to continue on. This is what I suspected would happen in the end and frankly, it is very underwhelming. After all that build up, implying how bad it would be to transform and how painful it was… the comic doesn’t make or show it be as bad as it was built up to be. Almost have a year was spent on building to this, but nothing. It’s a letdown, having this terrible message to trauma victims that their inner pain really isn’t THAT bad and once you accept, it will be alright. That may be okay for some people, but it feels too simplistic and easy of an answer for a real-life issue. The pacing, on the complete flipside of the previous issues, feels really quick and the whole story goes by an almost an instant. The story itself still flows but things are moving far faster than ever before. The dialogue and narration are kind of awkward and stilted at points, while the occasional jokey inner narration feels at odds with the tone and heaviness the story is trying to convey. The ending, like mentioned, I’m rather mixed on since it feels too easy and quick for how much the writer has been showing and saying how troubled Jen is right now. The opening scene and bit at the museum are nice, but that’s really it. I’m curious to see where things go in the next few issues, given how independent and different they are from one another, but I’m really not feeling this comic right now. We wrap up with the artwork and unfortunately, something went terribly wrong here. I’m not sure if Nico Lean was rushed or behind with drawing this, because the work here feels very crude and a disappointment compared to previous volumes. 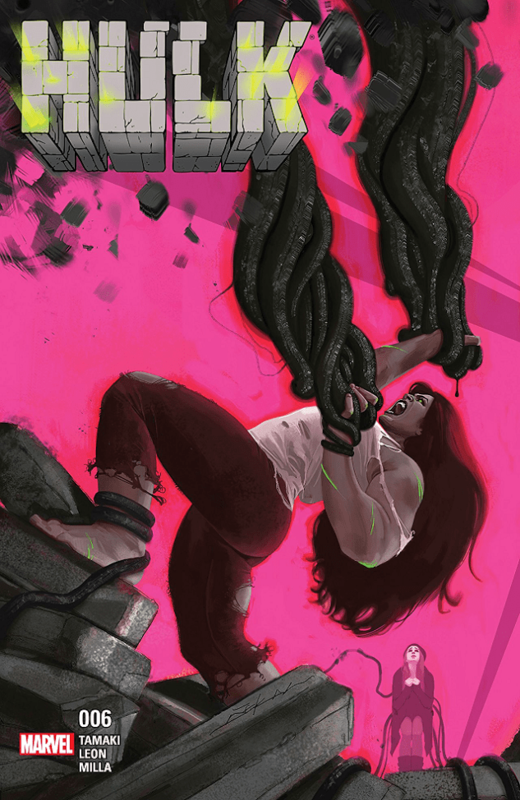 First things first, the design of Jen’s new She-Hulk form. It’s not unexpected, looks similar to the covers, but it is also kind lanky and bestial in a way with how Jen is hunched over, her spine seems to be poking out, and how she moves like a gorilla at points. I’m not sure if the lankiness is the intention though since looking at the design and how Nico drew Jen as regular She-Hulk in this issue (looked like Jen normally, just colored green), I don’t like his conception of drawing Hulk-like characters. They just seem too small and thin to be Hulks with barely any muscle to them. regular line work and colors. This is a visually unimpressive-looking book and for being the big climax to what had been a pretty decent looking series, this is a big problem. Hulk #6 dropped the ball. The story is a letdown due to how rushed and anti-climactic it feels after all the buildup this entire arc, while the big climax everyone was waiting for no longer fits due to the storytelling and writing either. The character arcs feel rushed, and the art dipped considerably. After all of this buildup and waiting, I can’t recommend sticking with Hulk for the time being. Strong opening and ending pages, kind of. Artwork has its occasional moments. Lackluster conclusion to the arc and Maise’s storyline. Has some rather unfortunate implications in its writing. The Hulk portions clash with the writing and tone that has been established up until this point. The artwork dropped in quality a lot in this issue.